Teach the kids how to craft beautiful paper just like you buy in the specialty stores. 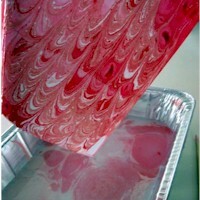 This East Marbleized Paper is a fun and fascinating project that produces papers you will be proud to use. To make this fun and easy marbleized paper you will need: 1/2 tsp alum (helps paint adhere to the paper), 2 cups liquid starch, liquid acrylic paints, a long wooden skewer, 9 X 13 pan and white copy paper cut to fit the inside your pan. You can change up the size of the pan; just keep the proportions of starch and alum the same. The starch should be 1 to 2 inches deep in your pan. Pour 2 cups of liquid starch in the pan then add 1/2 tsp alum stirring until mixed. 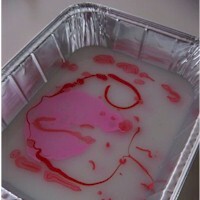 Gently drop acrylic paint on the surface of the starch. Some paint will sink to the bottom - do not worry. Try not to use too much paint. For best results choose light and dark colors that go together. It will take some experimenting to know how much paint works best for you. Brands of acrylic paint differ in consistency. If after several tries you have trouble with the paint not staying on the surface, try adding a drop of water to your paint. Take the wooden skewer and drag the paint through the starch. Continue dragging the skewer through the paint until you get a design you like. You might try other tools like a fork, feather or comb besides the skewer. 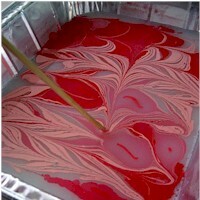 Really the fun of this activity is watching the paint swirl around making different designs. There is no right and wrong. Enjoy the experimenting. We were mesmerized —- we hope you will be also! Lay your piece of paper on top of the starch. Allow it to sit for a couple of seconds. 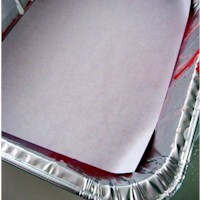 Then lift the paper out of the pan and allow the starch to drip off the paper. Rinse the paper under running water removing any extra starch. This does not change the intensity of the colors. After the paper has been rinsed, lay it out to dry. It will take about two hours for the paper to dry. When the paper is completely dry iron on medium setting until the sheets of paper are flat. You may find that you can print two sheets of paper before adding more paint to the starch. If you feel that you have made a lot of prints and your starch is too full of paint, just pour it out and start again. The possibilities of what to do with your paper are endless—- cover pencils, a book or a box, make note-cards or a picture frame etc. Kathleen Ricketson is the originator of WhipUp.net and has this to say about the site. "This website has been created in order to bring the best original and exciting crafts to the attention of many. To create a community of artists, crafters and makers and share ideas in a central space."